Head into the Fortnite Item Shop today to pick up the brand new Malice skin as well as the matching Burning Axe pickaxe. Nothing gets the juices flowing in Fortnite fans like a slick legendary outfit, and the latest has arrived in the form of the new Malice skin. 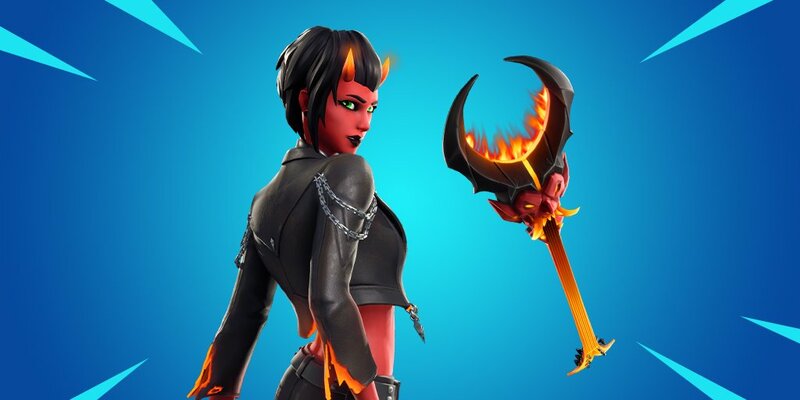 A she-devil with green eyes and a heart presumably black as coal, the leather-and-chain clad Malice legendary outfit also pairs nicely with the recently released Burning Axe pickaxe. Available right now in the Fortnite Item Shop, the Malice Legendary Outfit can be purchased for the sum of 2,000 V-Bucks. The Burning Axe, which looks more like a gnarly flaming guitar behind held the wrong way, is just an Epic offering, so it can be purchased for only 1,200 V-Bucks. Is the skin hot enough for you? Check out the preview hosted on the Fortnite Twitter account below and decide for yourself. Of course, the Fortnite Item Shop offers more than the Malice skin and Burning Axe. The current lineup includes: The epic True Heart emote and Airlift glider, offered at 800 V-Bucks and 1,200 V-Bucks respectively; the rare Electro Swing emote and Ice Pop pickaxe, available for 500 V-Bucks and 800 V-Bucks respectively; and the uncommon Commando and Highrise Assault Trooper outfits, both available for 800 V-Bucks. What else is new in the latest Fortnite Season 8 experience? Patch version 8.10 changed how Nintendo Switch matchmaking works in order to sync players on the hybrid handheld up with mobile players exclusively. There's also the new hamster ball Baller vehicle, which is certainly something players will want to look out for. Epic Games has been making a lot of headlines outside of Fortnite news as well, including the reveal of a free online service for all game developers. The Fortnite Malice skin and Burning Axe pickaxe won't be around for very long, and once it disappears, there's no telling when it will return. Scoop it up now in the Fortnite Item Shop and be the envy of opponent's eyes forevermore. For more top-tier tips and breaking news highlights, be sure to stop by Shacknews' Fortnite home page.